This is my first cutting board and I’m really excited with the way it turned out except there is one spot where I must not have clamped well enough and there’s a very small space between two boards. Is there something like wood hardener that I can put in there in order to not have it be affected when water gets in there? If not, I could rip that piece out. It’s the last board and would only take about an inch off the width. 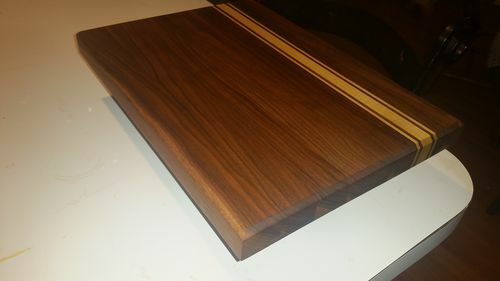 Walnut and ash, finished with cutting board finish. You can fill it with epoxy putty. Alternatively, you could rip and re-glue it and only lose a kerf width from the board. I had a similar issue. Like Rich mentioned above, I chose to rip and re-glue. That’s a great idea. Thank you!